Magic Piano is a musical gaming app created by Smule, a company well versed in music related apps with titles ranging from Ocarina to I Am T-Pain. Magic Piano allows you to buy and perform a number of well known songs and even offers a song of the day which can be downloaded for free. Purchases are made with “Smula” (the official currency of Smule) which can be earned by either watching advertisements or purchased with cash. Magic Piano’s controls aren’t too tricky. Much like Tap Tap Revenge glowing balls float down from the sky as your cues. As long as you generally tap in the same column as where the note fell then you’ve hit the right key. However unlike Tap Tap you don’t wait for the ball to reach the bottom of the screen for correct timing. Instead you’re cued with a beam of light shining on the balls. In most simulation style games if you slip up the song keeps on going without you, however Magic Piano takes a different approach. The song’s pace and rhythm is dictated by you. If you don’t hit the next note then the ball just patiently floats in the middle of the screen waiting for your next tap. Of course if you tend to stay at that level of proficiency the song might start to get unrecognizable, and you’ll have to start thinking about how to be less bad. Don’t worry though, there’s no crowd to boo you in this game. Magic Piano tries to keep your self-esteem intact. 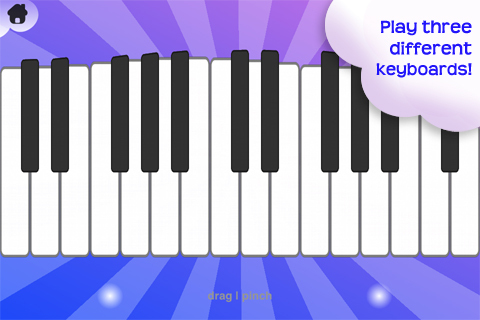 Magic Piano has a free style mode where users can jam out and play whatever they like. Aside from the default keyboard free style mode has a number of different keyboard layouts including a circular and spiraling keyboard. These different options are fun and clever, however the novelty wears out pretty quickly. 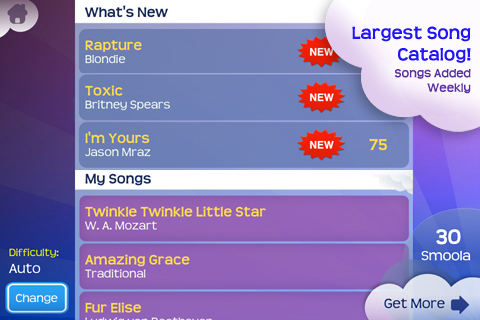 Magic Piano also allows you to multi-tap different notes at the same time (those crazy musicians call them “chords”), a feature a surprising amount of apps don’t have. You can also entertain and/or annoy your friends by sending them your performances. Magic Piano is a new take on a familiar game with its share of successes and failures. I’m not sure if it is possible to play the game with a song you haven’t heard before (though I’m also not sure why you’d want to), since the timing cues are a bit ambiguous. In general I would definitely pick Smule’s great new MadPad app over this one by a mile. If you feel like pretending to play the piano or are really into musical simulation games then check this app out. AppSafari review of Magic Piano was written by Neema Akhtar on September 14th, 2011 and categorized under App Store, Music, Music. Page viewed 5120 times, 1 so far today. Need help on using these apps? Please read the Help Page.